Within the nursing community, Dr. Joan Such Lockhart is known for her leadership in nursing education as a teacher-scholar within the context of her oncology nursing specialty. Many of her contributions in teaching, scholarship and service extend beyond her employment. She has held certification in advanced oncology nursing for over 15 years and taught clinical nurses within a major health care system. She has taught both undergraduate and graduate students at Duquesne University School of Nursing for the past 30 years as a clinical professor. Early in her professional career at Eye and Ear Hospital of Pittsburgh (now University of Pittsburgh Medical Center), Joan provided direct care to patients diagnosed with head and neck cancer and treated with extensive surgery, radiation and chemotherapy. Later, she held an administrative position on the unit and then became clinical specialist in head and neck oncology within the hospital’s staff development department; she eventually was dedicated to the head and neck unit to provide ongoing one-on-one mentorship to retain newly hired nurses. In that role, Joan witnessed the impact that a dedicated educator could have on new graduates’ retention, satisfaction and competency. After becoming faculty at Duquesne University in 1986, she continued in staff development during summers. Assuming dual roles in academia and practice gave her insight into the needs and opportunities for collaboration. When staff development departments downsized, clinical nurses were asked to assume a new and often additional role as unit-based educators. That change encouraged Joan to publish a book through the Oncology Nursing Society (ONS) to help clinical nurses in this transition. Joan volunteered to serve in leadership roles in professional nursing organizations, such as ONS, to effect change through boards, national workshops and education, as well as through the editorship of oncology journals. 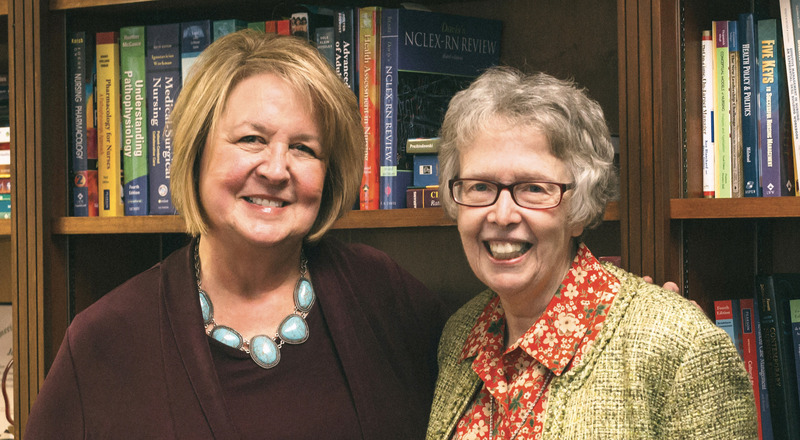 In 2000, she co-created a leadership and professional development feature within ONS’s Oncology Nursing Forum, a place for oncology nurses to share their successes. Given the current and projected increases in the numbers of cancer survivors, she was asked by ONS in 2009 to lead a team of researchers to explore cancer content in the curricula of U.S. pre-licensure registered nurse and nurse practitioner/clinical nurse specialist programs. Evidence that resulted from this study supported its inclusion in the ONS Strategic Plan and led to the recent development of pre-licensure RN core cancer competencies. Most recently, Joan led a second team with ONS to determine the learning needs of practicing non-oncology RNs who care for cancer survivors in settings not designated for acute cancer treatment. All these initiatives strive to provide survivors with safe, quality, lifetime care, regardless of health care setting. Joan has also extended her leadership in education-oncology nursing internationally through Duquesne University’s collaboration with the Universidad de Politecnica (UPOLI) School of Nursing, a sister school in Nicaragua, and with nurses in the Nicaraguan Health Ministry (MINSA). Efforts that began in 1995 and continued through the 2000s resulted in an undergraduate baccalaureate-level curriculum, clinical experiences in cancer health for students, and faculty development in these areas for leadership and sustainability. In 2001, she expanded her collaboration with UPOLI colleagues by planning, implementing and evaluating a nurse-led cervical and breast health and screening program housed in a new nursing academic center run by UPOLI nurse faculty in an underserved barrio. UPOLI adopted this barrio that houses more than 10,000 people as a primary clinical site for its students. Although the project primarily focused on the cancer health outcomes of Nicaraguan women, it was an opportunity to provide in-depth faculty development about these cancers, allowing instructors to integrate concepts into their curriculum, become leaders in this area and enable their students to develop competencies. This clinic still exists, with plans for replication in a more rural area. This project was the product of prior collaboration with Nicaraguan nurse leaders from MINSA. In 1995, I served as project leader for a cancer nursing course co-sponsored by ONS for 30 clinical nurses from MINSA. Through course discussions, the need to explore barriers to cervical and breast cancer screening in Nicaraguan women became evident. Joan’s team explored these barriers with the assistance of a research grant; results served as a foundation for UPOLI’s cervical and breast cancer project. Through her experience in nursing education and oncology, Joan envisioned the impact that collaboration between UPOLI nurse faculty and MINSA nurse leaders could have in developing sustainable initiatives led by Nicaraguan nurses. Similarly, her creative leadership as an experienced educator and oncology nurse enabled her to envision possible solutions. These approaches combined service and education in developing the nurse as a leader to build capacity and a shared commitment with Nicaraguan nurses toward a “common good” — the health of vulnerable Nicaraguans. These nurses overcame language, culture and distance barriers to implement projects designed with integrity and committed to excellence. Because of their work, the care of persons with cancer was enhanced. I have known Joan Lockhart for almost 40 years. She has never wavered in her compassion and deep commitment to improving care to persons with cancer and enhancing the capabilities of the nurses who care for them.